A range of moisture and dirt resistant enclosures for the convenient installation of ESP protectors and their associated CME kits. 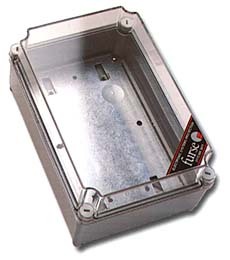 Enclosures have a grey base with either a see-through or grey (part number /G or /GS) lid. Use WBX enclosures when your ESP protector(s) can't be installed within the existing equipment panel or enclosure and for added protection in damp and dirty environments. The protector(s), or CME kit, are mounted on the metal base plate, which in turn mounts in the enclosure.